DETROIT (WWJ) – They shop with a list and get in and out of a store quickly. But we’re not talking about your Grandma at the grocery store. We’re talking about crooks. Shoplifting has always been a problem. But now there's something new: organized retail crime. Gangs and individuals target retailers, scooping up thousands of dollars of merchandise in just a few minutes. They travel in a group – there's a driver, look out person and two or three people who hit up the stores, dumping merchandise into strollers or specially made bags. Then, they just walk out of the store, shove their bounty in a waiting van and drive off to another shopping area. Most startling is the National Retail Federation reports 95 percent of retailers have had this happen to them. Police on Thursday released surveillance video of downtown's latest smash-and-grab robbery. In the video, three men are seen running into the 21st Century Jewelry store, located at 749 S. Broadway. One of the robbers pepper sprayed the store's employee, while the other two men smash glass jewelry display cases. As the clerk huddles behind the counter, the men grab whatever they can carry and flee the store. "We think that the word has gotten around that this is somehow easy money, but I'm here to tell everyone, we've put 13 people in jail over the last couple weeks and we'll keep doing that until they realize the pickings aren't so easy," said Lt. Paul Vernon of the LAPD. 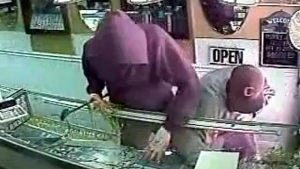 We've been seeing these smash-and-grabs occurring for several weeks," said Vernon. "As you can see in the video, the use of pepper spray has become a common tactic." Your News May Help Create New Jobs!